People have to clean up data in their computer, especially C disk to keep their computer running smoothly. But sometimes we have to format the disks and re-install them when the computer can’t run in a normal way. If you are using iPhone, you may find that after re-installing iTunes on your computer iTunes does not recognize iPhone. So what to do when iTunes not recognizing iPhone at this moment? 1. Generally speaking, when iTunes does not recognize iPhone, it may have something to do with the version of iTunes. If you are using an old version of iTunes on your computer, it may not be capable of recognizing your iOS devices. So updating iTunes to the latest version is a fastest way to get the problem solved. 2. If you are running iTunes in the latest version, but still can’t get your iPhone recognized, you may want to take a look at your computer, sometimes if your computer lacks necessary software, it might lead to the malfunction of iTunes. 3. USB port on your computer can be another reason why iPhone not recognized by iTunes. So you can try more than one USB port to see whether the USB port works well. 4. Of course, your iPhone may also be the cause of iTunes not recognizing iPhone. At this moment, you can restart your iPhone by holding the Sleep/Wake button and Home button at the same time until you see the Apple logo, then connect iPhone to computer with USB cable again. 5. You should also make sure your iPhone trusts your computer, because after changing a new system on computer, your iPhone will regard it as a new computer. What’s more, you should check out whether Apple Mobile Device Support is installed on computer. 6. After checking out all the aspects mentioned above, you can try to connect iPhone to computer with the USB cable again. If none of these methods work out, you may want to try set your iPhone up as new after iTunes not recognizing iPhone. You only need to tap General > Settings > Reset > Erase All Content and Settings, and then choose Set Up as New. 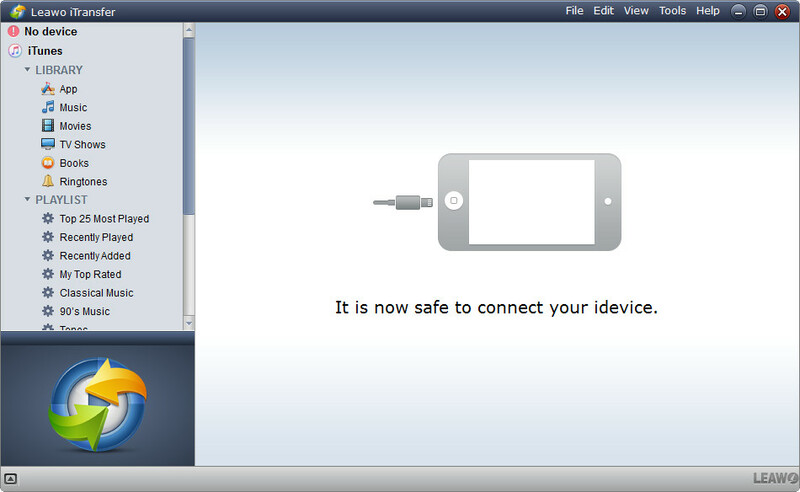 When you have set iPhone up as a new device, you are able to connect iPhone to computer with USB cable. But before erasing all contents on your iPhone, you may want to back up iPhone files to computer to keep them safe. As iTunes does not recognize iPhone, you won’t be able to use iTunes to update your iPhone backup. But iCloud will provide you much help. If you have connected to Wi-Fi, you can tap Settings > iCloud > Storage and Backup > Back up Now to create an iCloud backup. But the media files won’t be included in an iCloud backup, so you will need an iPhone transfer program to back up the media files from iPhone to computer you want to set up iPhone as a new one. Among all the iPhone transfer programs, Leawo iTransfer is regarded as the best. 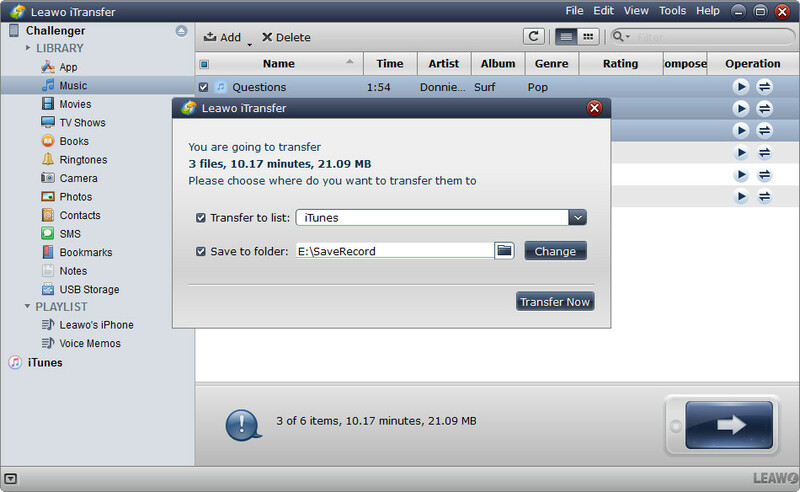 This software is used for transferring files among iOS devices, iTunes and computers, and it allows users to transfer various kinds of files without using iTunes. The following guidance will show you how to use Leawo iTransfer to back up iPhone files when iTunes doesn’t recognize iPhone, and you can free download the software to have a try. 1. Run Leawo iTransfer and connect iPhone to computer with the USB cable. The software will recognize your iPhone. 2. Click the name of iPhone and choose a library in the left sidebar. The contents in that library will display in the right part. 3. Hold Ctrl/Shift key to select files, and click the transfer button at the right bottom. Or right-click a selected file and choose Transfer to > My Computer. 4. 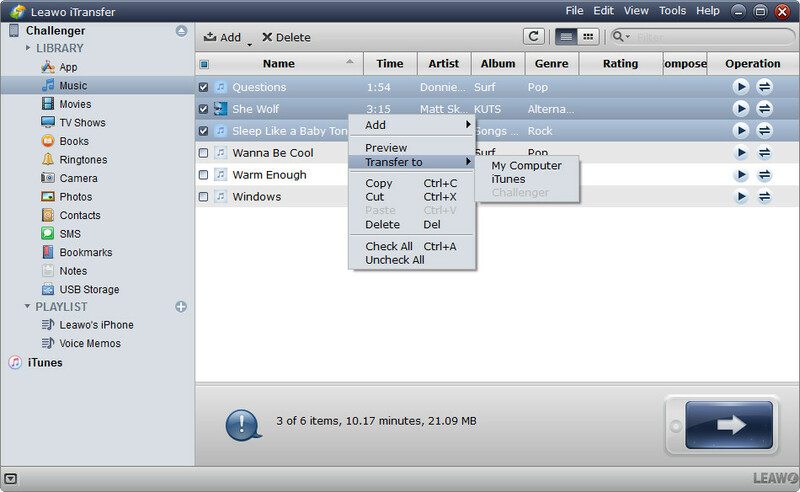 After selecting files, you will see a pop-up dialog. Check Save to Folder and click Change to choose a target folder on your computer to save the files. Then click Transfer Now to start backing up iPhone files to computer. When the transfer finishes, you’ll get the files in the target folder. If iTunes doesn’t recognize your iPhone, you can transfer these files back to your iPhone with Leawo iTransfer, so that you won’t lose any data after setting up your iPhone as new. Leawo iTransfer is also helpful for other kinds of data transfers of iOS devices, for example, you can transfer photos from iPhone to iPad for an enjoyment. If you are interested in this software, just check it out.